[Tuesday, April 1, 2008] Google and Virgin Group today announced the launch of Virgle Inc., a jointly owned and operated venture dedicated to the establishment of a human settlement on Mars. [Tuesday, April 1, 2008] The Ares I-X test flight in April 2009 will be a milestone in the transition of NASA's property, facilities, and workforce. [Thursday, April 3, 2008] NASA is currently working toward PDR for the Ares I and Orion vehicles. While this is a phase for discovery and risk reduction, there are considerable unknowns as to whether NASA's plans an be executed within schedule goals. [Monday, April 7, 2008] Aerojet and Orbital Sciences Corporation announced today that together the two companies successfully conducted a static firing of the jettison motor, a key component of the Launch Abort System for NASA's Orion human spaceflight program. 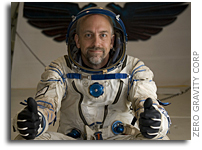 [Wednesday, April 9, 2008] April 21, 2008 at 12:00pm ET, Richard Garriott will hold an interactive live webcast with students and teachers discussing his upcoming flight to the International Space Station (ISS), scheduled for October 2008. [Wednesday, April 9, 2008] Challenger Center for Space Science Education invites students to use their creativity to design an original piece of art for a student mission patch for private space explorer, Richard Garriott. [Wednesday, April 9, 2008] NASA has selected nine proposals for negotiation of Phase 2 contract awards in the Small Business Technology Transfer (STTR) program. The selected projects have a total value of approximately $5.4 million. [Wednesday, April 9, 2008] The Space Report 2008: The Authoritative Guide to Global Space Activity, released by the Space Foundation today, revealed more than $251 billion in global space activity in 2007. [Thursday, April 10, 2008] Commander Sergei Alexandrovich Volkov and cosmonaut Oleg Dmitrievich Kononenko of the 17th International Space Station crew docked their Soyuz TMA-12 with the orbiting laboratory's Pirs Docking Compartment at 8:57 a.m. EDT Thursday. [Thursday, April 10, 2008] While there are jobs at stake, perhaps this case has shown the government that investing in space is important to Canada's interests and that they should try to revive an industry that has been neglected for some time. [Thursday, April 10, 2008] "I continue to marvel at the Shuttle ... as Mike Mott liked to say, it's a launch vehicle - a reconfigurable science platform - a hypersonic reentry vehicle - and a glider. It's reusable and it runs on the computing power of your watch!" [Tuesday, April 15, 2008] CAW national president Buzz Hargrove is calling on the federal government to formally end talks between MacDonald Dettwiler and Associates (MDA) and U.S.-based weapons producer Alliant Techsystems (ATK) for the sale of MDA's space and robotics division. [Tuesday, April 15, 2008] "You may have heard Mike Griffin or me mention the Space Economy in our speeches and wondered what it is and why we are talking about it." [Tuesday, April 15, 2008] Now, for the first time ever, the public can request their own personal photo of our home planet through the Association of Space Explorers' (ASE) "Earth Portraits" program. 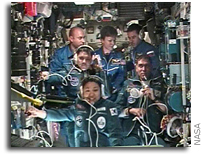 [Friday, April 18, 2008] Preparing to conduct science experiments while floating weightless in an airplane has been no easy task for the Maine team chosen to participate this summer in NASA's Reduced Gravity Student Flight Opportunities Program. [Sunday, April 20, 2008] "On Thursday, April 10, I, along with several other NASA officials, was on hand to view presentations designed and developed by students attending the Art Center College of Design in Pasadena, California." [Monday, April 21, 2008] JAXA and NICT performed a verification of regenerative switching functions between an ultra small-size user terminal and a high-speed small ground station using the onboard multi-beam antenna*1 of "KIZUNA. [Monday, April 21, 2008] NASA seeks proposals for collaboration with an organization to enhance NASA's ability to achieve its educational goals by creating and managing a Massively Multiplayer Online (MMO) game. [Tuesday, April 22, 2008] A novel mobile phone programme, able to provide information on what you see when you see it, was a regional winner in the European Satellite Navigation Competition, sponsored by ESA's Technology Transfer Programme. [Tuesday, April 22, 2008] NASA has awarded Space Exploration Technologies, or SpaceX, a NASA Launch Services contract for the Falcon 1 and Falcon 9 launch vehicles. [Tuesday, April 22, 2008] "To those of us who have committed our lives to the proposition that the exploration and development of space, recent events have a familiar and depressing feel." [Wednesday, April 23, 2008] Governor Bill Richardson released the following statement about the successful passage of a tax to support Spaceport America. Sierra County residents overwhelmingly approved the tax in a special election today. [Friday, April 25, 2008] NASA's Ames Research Center, Moffett Field, Calif., and m2mi Corp., Moffett Field, Calif., announced Thursday they are taking a revolutionary step forward in improving telecommunications and networking from space. [Sunday, April 27, 2008] A further step towards the deployment of Europe's Galileo global navigation satellite system was taken with the successful launch of ESA's second Galileo In-Orbit Validation Element (GIOVE-B) satellite. [Monday, April 28, 2008] The AIAA is pleased to announce Inside Aerospace -An International Forum for Aviation and Space Leaders, at which invited leaders from government, industry, and academia will focus on "Working Together to Build the Aerospace Workforce of Tomorrow."